Spin-the-wheel games aren’t just for casinos! These addicting prize games are great at spurring participation in tons of different environments - like trade shows, fundraisers, and schools, to name a few! But how do you play games with a prize wheel? It may seem like a silly question - you just spin the wheel and hope the ticker lands on the right section, right? Well, there are actually many types of games you can play using a prize wheel! Plus, spin-the-wheel game ideas can easily match up with your goals for event participation - and we’ll show you how to make it happen! See All Our Prize Wheels! A lot of these prize wheel ideas can be accomplished at home or in the office with some basic craft supplies like construction paper, paint, and markers. You can also create custom sections for your wheel game on the computer! Just print the sections in color, cut them out, and slide them into the slots on your wheel. Lots of prize wheels come with write-on surfaces, so with those all you’ll need is a wet/dry erase or liquid chalk marker to make your game come to life! With these types of wheels, you could host a game night and try each and every one of the prize game ideas below! Win a Prize - Each section of the prize wheel has a different prize, from inexpensive trinkets to free trips! Use the chance to win as a way to pull in trade show goers or sell spins at fundraisers. Trivia - Each section has a different category of trivia. For example, you spin and land on the "Geography" section - your question might be, "What is the smallest country in the world?" Fun, right? Create your own trivia categories and questions, or use with a game you already own. What's for Dinner? - Fill your prize wheel with the week's meal options and spin to help you decide what to have! Ice Breakers - Each section has a different get-to-know you question, like "If you were an animal, which one would you be and why?" This is a great team-building activity for students and employees. Educational Games - Spin-the-wheel games can be a fun way to prepare for quizzes or review lessons while keeping students engaged. Fortune Teller- Let the wheel tell you your future with this fun game! For example - should you share this article with your friends? Yes? Probably? Definitely! Chore "Game" - Is it possible to make chores fun? Maybe, with this game of chance! Have your kids spin for the weekly dusting, vacuuming, or dish duties! Workout Selecter - Spin the wheel to determine which exercises you'll do - will it be jumping jacks, or toe touches? 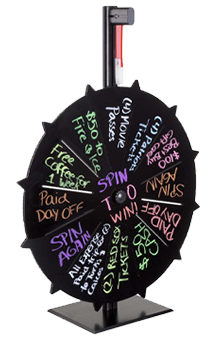 Use the prize wheel to pull attendees into your booth with the hopes of winning a prize. Sell tickets to guests for a chance to spin the wheel and win a prize! Make learning fun with a spin-the-wheel study game! You can also use the wheel for get-to-know-you activities on the first day of school. HR-sponsored gaming is great for employee morale! Or use the spinner to decide who brings the cake to the birthday party. Make a chore wheel and have the kids spin for weekly tasks. Loads of fun for parents! Great for CrossFit style environments - spin for jumping jacks, crunches, or burpees. Have fun & we hope lady luck is on your side! Share Your Prize Wheel Ideas! We would love to see how you're using your prize wheels. Show us on social media by tagging your photos with #Displays2go and you could get featured!